We often have to deal with others who are grumpy or just unhappy, and this is something not everyone is good at doing. Sometimes the emotions of others can be too overwhelming, or it can leave them feeling frustrated themselves because they fear they cannot help. 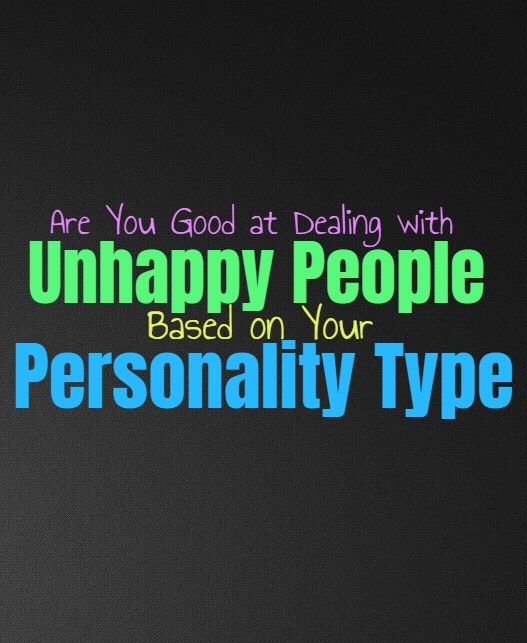 Here is how you deal with unhappy people, based on your personality type. INFJs often understand that people can’t be happy all of the time and so they try to be understanding. They usually show their support by simply listening and being there for someone who is feeling down or struggle. When INFJs have a hard time being around unhappy people, is when this backfires and ends up leading these people to hurting others. INFJs have a hard time being around people who constantly allow their own pain to hurt others around them, especially since they are empathetic and caring people. They try their best to help, but sometimes this can drain the INFJ and leave them feeling unhappy as well. ENFJs can actually have a hard time being around unhappy people, since their instinct is to fix this. They dislike seeking people in pain and so they want to find a solution to this. When they are around unhappy people the ENFJ can often feel and sense this, sometimes even so much so that it overtakes their own emotions. ENFJs have this powerful sense of empathy and so being around unhappy people can actually be exhausting for them after a while. They often try to help, but when they cannot make things better it takes a toll on the ENFJ. INFPs often do their best to deal with unhappy people without becoming bothered by it. They understand that people cannot control their emotions and personally dislike when someone tries to force them to do the same. INFPs want to give others a chance to be themselves and express their emotions without feeling judged for it. INFPs can often deal with unhappy people by just letting them feel this way and not trying to change them. INFPs only have a hard time with unhappy people when it is their job to try and solve their problems or make this person happy, like in a customer service job. ENFPs can often handle being around unhappy people for short times, but after a while this can be draining for them. They need to be around positivity in order to thrive and continue moving forward. ENFPs believe in growth and don’t like feeling stagnant, sometimes being around unhappy people can leave them feeling a bit trapped in their current situation. For the ENFP it is best to be around others who want the same things and who inspire them to progress and open themselves up to change. INTJs don’t really like dealing with unhappy people who are constantly expecting them to change their situation. INTJs are problem solvers, but emotions are something they struggle to really deal with most of the time. They just don’t like having to try and help someone who is being emotional and not using their minds to make themselves happier. INTJs focus on getting things done and accomplishing their goals, knowledge is often the thing which makes them happy. For the INTJ unhappy people can be exhausting, since they are often needy and demanding. ENTJs don’t really know how to respond to unhappy people, since they are problem solvers but not when it comes to emotions. They often do their best to try and fix the situation but when someone is being overly emotional they don’t always know how to respond. These situations can be deeply draining for the ENTJ, who really just wants to focus on being efficient and tending to the more practical needs of those around them. INTPs often understand allowing people to just feel a certain way, but sometimes being around unhappy people can be draining for them. They don’t always understand why this is happening, or why it making them feel so uneasy. INTPs can sometimes be dragged down by these unhappy people, and really just want a sense of space from them. They especially dislike unhappy people who are using only emotions and no logic. INTPs can often solve problems, but emotional ones become truly trying for them. ENTPs don’t want to allow unhappy people to bring them down, especially in a customer service setting. When they are around people who are unhappy and demanding, the ENTP does their best not to let these feelings overwhelm them personally. They prefer to have a sense of space from these people, probably wanting to do their own thing away from this negativity. ENTPs can appreciate being unhappy for certain reasons and will do their best to be comforting when it is someone they love. It just doesn’t always come naturally for them to really know how to respond to emotional outbursts. ISTJs don’t really like handling unhappy people, since they try to keep emotions out of their work. When they are trying to get something done they want it to be logical and efficient. If they are in a setting where someone has a problem and they are simply being emotional and unhappy, it becomes exhausting for the ISTJ. When it comes to their personal lives they try to be as understand as they can when it comes to people being unhappy, but this can still be challenging since they don’t really know how to solve these issues. For the ESTJ dealing with unhappy people often depends on what is making them unhappy and if the problem can be solved. If these people are simply unhappy and emotions, then it becomes challenging for the ESTJ to really know how to respond. When the person is unhappy for more practical reasons, then the ESTJ is capable of responding to and handling this with ease. They are good at problem solving, as long as they can focus on fixing a practical problem. ISFJs can be a bit overwhelmed by unhappy people, since they want to find a way to make them feel better. They can sense the emotions of others, especially the people they care for. ISFJs want to be able to help and make this person happy again, and will often go out of their way to do this. After a while it can become draining though, especially if the person seems like they cannot be helped or are going to be unhappy no matter what. ESFJs truly care about others and often work hard to make them happy. When someone around them is unhappy the ESFJ senses this and wants to find a way to make things better. It can be difficult for them to handle this type of situation when it seems a person is going to be unhappy no matter what. This puts a lot of pressure on the ESFJ, who really wants to please everyone and find a way to make their loved ones as happy as possible. Unhappy people rarely bother the ISTP all that much, since they don’t take responsibility for their happiness. If they are in a job where they must aid these unhappy people, they simply focus on the facts and don’t want to let emotions get in the way. While ISTPs can be good at this, they also become a bit drained with it after a while. Dealing with people constantly can be exhausting, especially if these people are emotional and constantly unhappy. ESTPs often try to avoid unhappy people, not wanting to allow their negative to become a drain. They focus on doing their own thing in life and are naturally independent people. When the ESTP cares for someone they do want to be supportive, but sometimes being around unhappy people can leave them feeling drained and unhappy themselves. They will likely try to find a way to fix this by changing the mood and searching for something fun to do. ISFPs do their best to respect the emotions of others and don’t want to try and change someone who is unhappy. ISFPs believe in being free to be open about their emotions, not wanting to hold back or pretend for the sake of someone else. If the ISFP is unhappy they want to be free to feel this way, and so they also want to give others this same courtesy. When a person is unhappy the ISFP often tries to be supportive, or give them the space they need. ESFPs can become drained around unhappy people, especially if this person continues to be this way. They might try and lighten the mood, finding ways to improve the situation and make the person who is unhappy, get excited about something else. ESFPs want to remain positive and so being around those who are constantly miserable, can leave them feeling a bit trapped. ESFPs might avoid these people, unless it is someone they love and in this case they try to make them ignore these unhappy emotions.